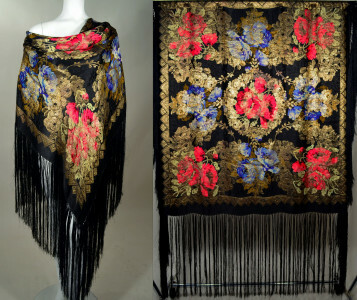 Twenties vintage gold silk lame shawl. Floral pattern in reds & blues mixed with metallic gold on a black ground silk jacquard. Metallic gold geometric art deco border pattern. Black silk hand tied fringe. Measures approximately 45" X 45" with 18" fringe. The ultimate in 1920'S opulence. EXCELLENT. Shows sight burnish at gold threads at one corner, some minor snags and a few darkish tarnish marks that show on reverse side.